Snow can be deceiving. 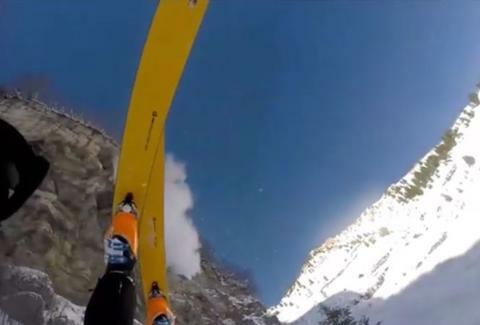 Sometimes, you’re just skiing along a beautiful, powder-capped mountain, before you literally fly off a cliff. That’s what happened to Devin Stratton. Because this is 2017 and filming your extreme escapades with a helmet-mounted GoPro is cool, he captured the terrifying plunge and put it on Instagram. Luckily, Stratton escaped unscathed. After plummeting downward for what seems like eternity, the man cleans off his camera, almost smiling. All he can say is “Thank you,” which yes, is probably the correct response after you skirt certain death. Everybody, just wear a helmet, ok?